First,we are committed the EARTH. We build our Native American drums using Green, Ecological methods. We do not cut down any trees. Our rawhide does not poison the earth with chemicals. Second, we are committed to our CUSTOMERS. We want to learn your stories and share our story with you. We play the drums for you to help you find the exact drum. We describe the appearance of your rawhide drum head. We send you the exact same drum that that you heard. If you compare Native American drums, you may notice that many of them seem to look alike. Our drums look different. Wonder why? Keith builds our own Hand Drum and Powwow Drum hulls. We do not buy factory made steamed hoops. 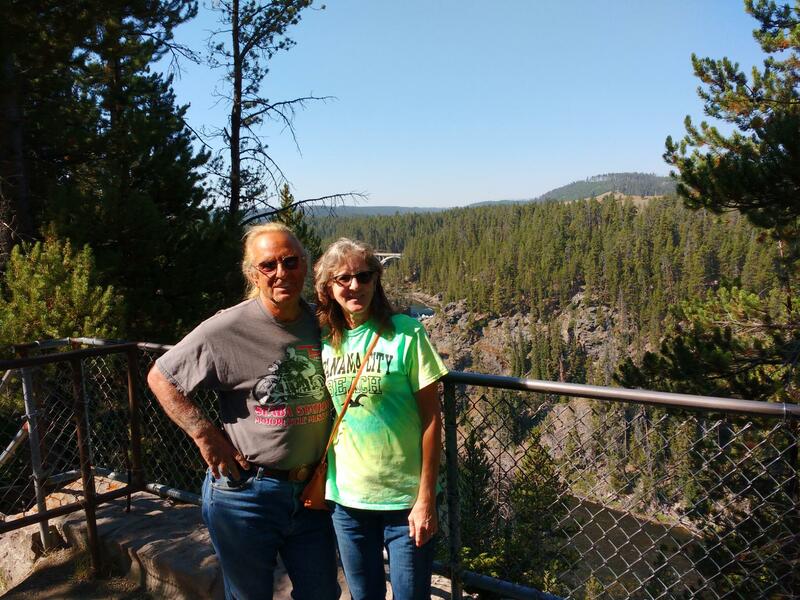 From the sawmill to the shipper, your native drum is handled by Keith and Cheryl, The Drum People, in a loving, respectful way. Some people call us tree-huggers. We call it Respect for Mother Earth. Become a partner in our stewardship efforts. 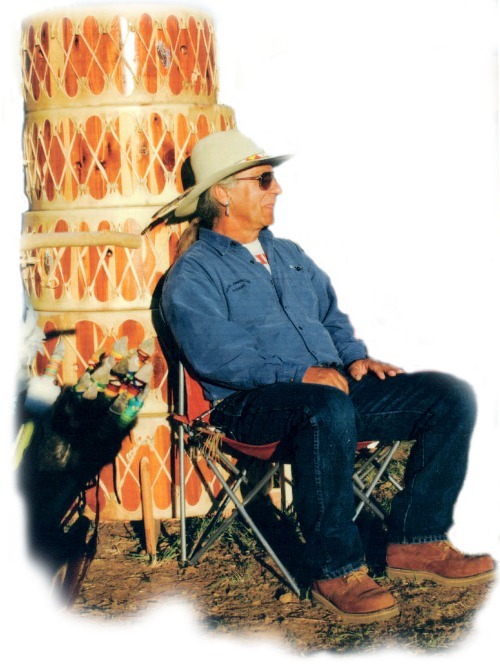 We believe that Native American Drums should be sacred instruments - from their construction in Keith's hands, to resting in Your hands, where they will carry your songs and prayers to Creator. How Does Keith Little Badger Builds His Drums? He builds all of his Native American Drums from Recycled Lumber. 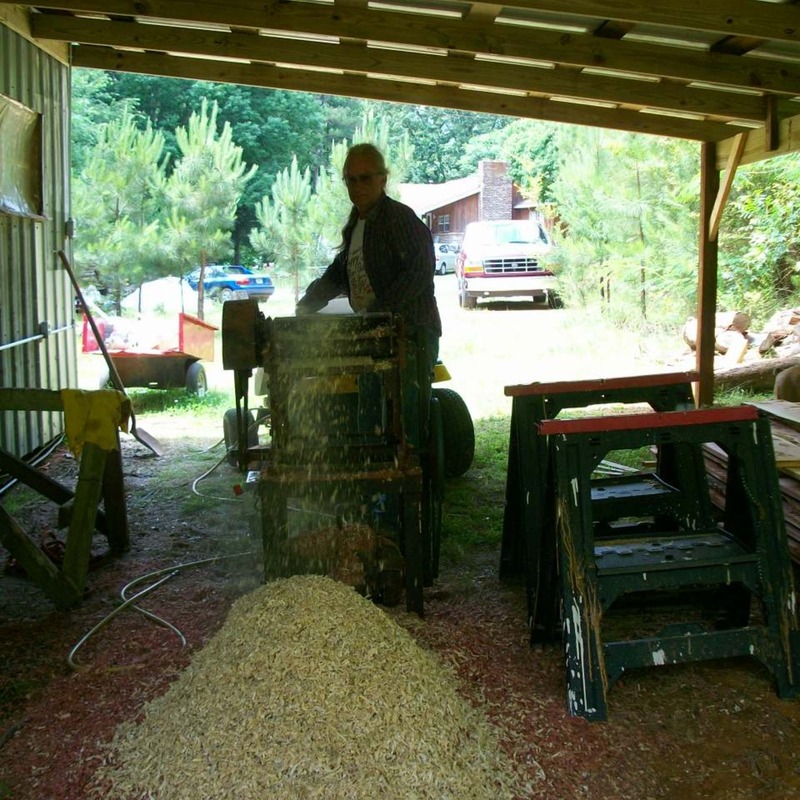 Keith Little Badger takes his logs to a small local saw mill to cut his boards to uniform thickness. The boards dry in his planer shed. Then Keith planes them to uniform thickness. We do not bleach or dye the hides as this will weaken them. Our hides are air-dried because electric dyers also weaken the hide. 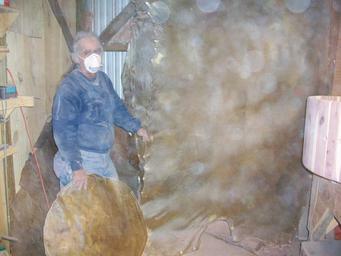 These natural Bull hides provide thick hide for Powwow Drums and thinner hide for Hand Drums. Because the rawhide is natural, each drum head is unique! We use the scraps to make lace for the drums and our rawhide rattles. 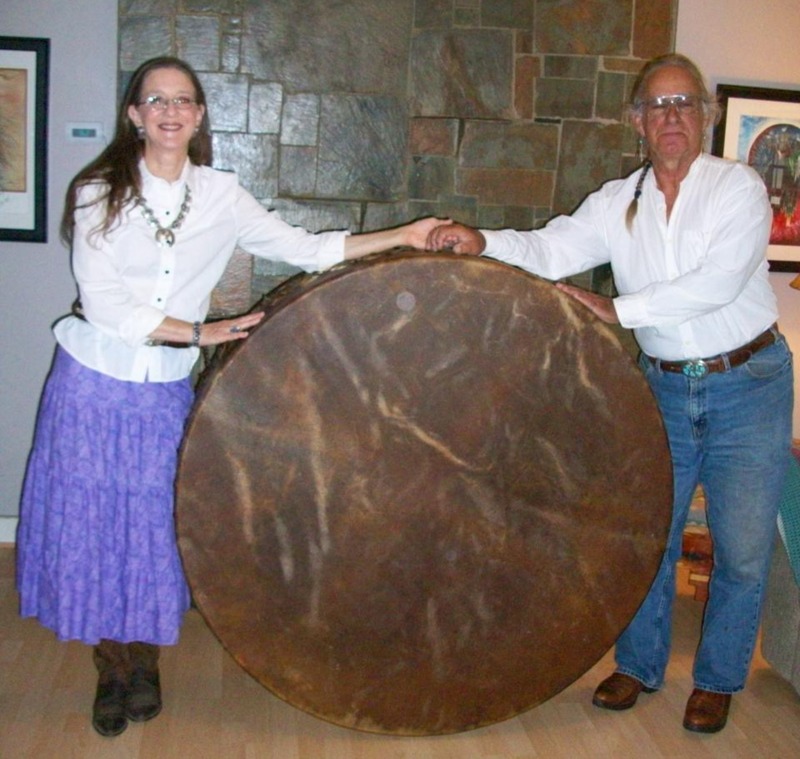 Our Philosophy about Rawhide We Use Domestic Cow Bull Hide on our Drums. We have spiritual beliefs that prevent us from using wildlife. Please visit websites below to understand our Philosophy. Thank you. Why Do We Build Drums? Making drums is not a job, it is a CALLING for us. but it also a healing tool. This is Who We Are . . .
We have donated or discounted drums to schools to help children learn about the REAL Indigenous People of this country, rather than allowing them to learn only from the biased stereotypes of "Indians" portrayed on television and in movies. We have sponsored cultural events, like Hand Drum Competitions, to showcase the talent of Native American singers and drummers. We hope to educate the public about the Indigenous People and Culture of the United States by supporting the beauty of their traditions and songs. We partner with groups of caring people who have found creative ways to use drumming to improve the health and quality of life of our Elders, and for people with diseases like Autism and Alzheimer disease. We have helped sponsor Native American Powwow Drum Teams so that they can play at powwows and share this wonderful culture with the public. We donate drums to Drug and Alcohol Counseling Centers. 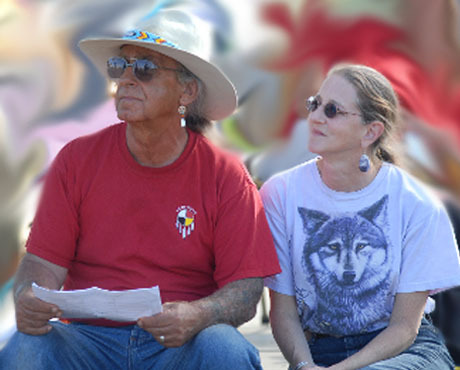 We have donated or discounted drums to Native Americans in prison so that they can practice their spiritual ceremonies. By doing this, we hope that Creator will guide them back to the good Red Road. We have donated drums and our time to help build homes for victims of tornadoes, hurricanes and floods. 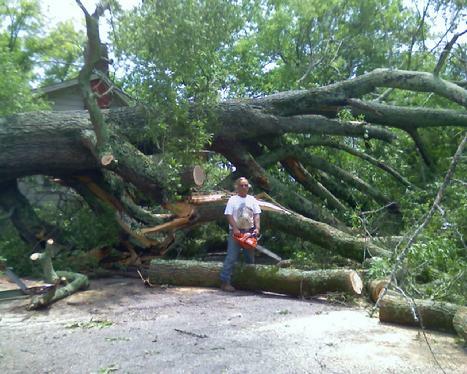 We volunteer in our community, at local food pantry, picking up trash on the side of our roads, removing downed trees from our neighbors' yards, and donating firewood. We give presentations on Native American Spirituality at local churches. We partner with wildlife rescue efforts, donating drums or giving discounts to horse rescue centers and support Wildlife Rescue Centers. When you buy a drum from The Drum People, you support the causes we support. We are people who want to Change the World. 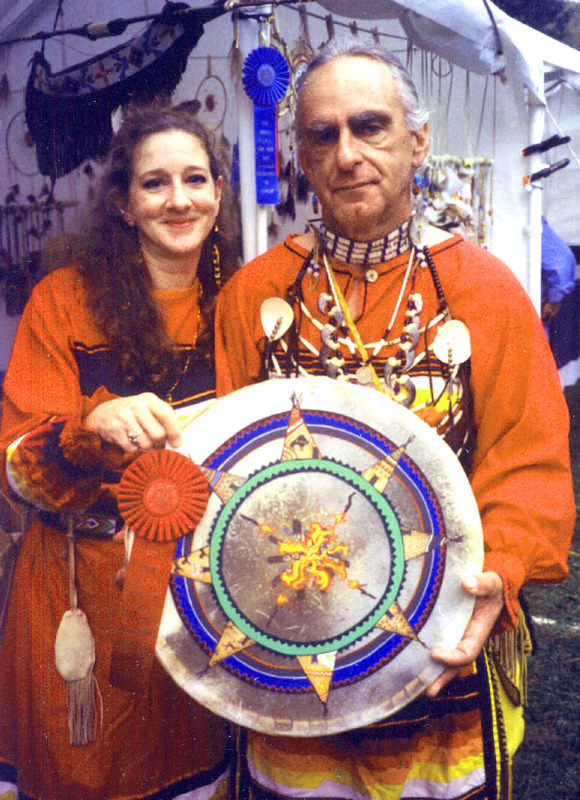 Keith Little Badger is in full compliance with The Indian Arts and Crafts Act of 1990. This Act protects Native American Artisans. All products must be marketed truthfully regarding the Indian heritage and tribal affiliation of the producers, so as not to mislead the consumer.